Caramel-filled Easter eggs have been my favourite Easter eggs for as long as I can remember. My mum still buys (and now sends in the mail) a bag of these for me each year. When it comes to eating caramel, or any filled eggs for that matter, there seems to be two very different opinions on the best way to do it: bite into the egg straight away for an instant hit of filling or let the chocolate begin to melt in your mouth before discovering the delicious filling inside. My preference is definitely the latter! These chocolate and caramel Easter egg muffins are a delicious way of satisfying the needs of BOTH groups of filled Easter egg connoisseurs. You can bite into the yummy chocolate muffin, then later discover a soft caramel-filled Easter egg to enjoy inside. These muffins are made all the more indulgent thanks to the creamy chocolate icing on top, and are taken to the next level by placing a couple of sliced pieces of caramel-filled Easter egg on top for decoration - and delicious enjoyment too! 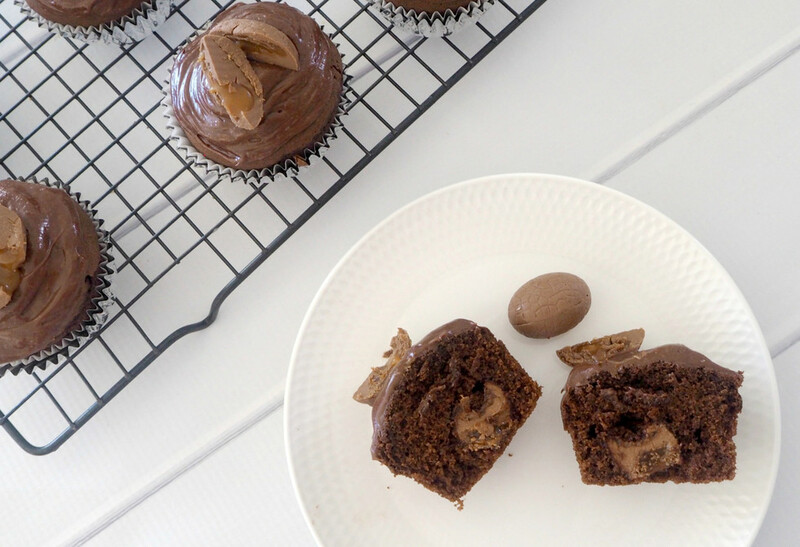 These muffins are the ultimate for chocolate (and caramel) lovers, and are perfect to enjoy both in the lead up to Easter, as well as to help celebrate the event itself. Preheat oven to 170°C and line a 12-hole muffin tin with paper cases. Place the butter and sugar into the bowl of an electric mixer, and beat on a high speed until light and fluffy. Add eggs and vanilla extract, and beat on a low speed until combined. Continue running mixer at low speed, and add half of the flour, cocoa and milk. Mix for 30 seconds before adding the remaining flour, cocoa and milk, and mix until combined. Spoon the mixture into the paper cases, filling each one until they are approximately one-quarter full. Place one of the caramel-filled eggs in the centre and cover with cake mixture until the paper case is two-thirds full. Repeat until you have used all of your cake mixture. Bake for 15-20 minutes or until muffins are cooked through. Every oven is different, so test by inserting a skewer into the centre of a muffin – the skewer should come out with no cake batter on it (though it might have a little melted chocolate and caramel from the egg). Let the chocolate and caramel Easter egg muffins cool in the tin for 10 minutes, before transferring to a wire rack to cool completely. Place chocolate into a microwave-safe bowl. Cook for 20-second spurts on high until it’s just melted, before removing and stirring until completely melted. Set aside to cool slightly. Meanwhile, use an electric mixer to beat the butter until it’s smooth, then gradually add icing sugar and continue to beat on medium speed. Add melted chocolate and beat at a medium speed to combine. Add milk, with the mixer going, 1 tablespoon at a time, until icing is a spreadable consistency. Use a small spoon to spread the chocolate icing over the top of the muffins and decorate with pieces of caramel-filled Easter egg. You can also use store-bought chocolate icing to decorate these muffins if you prefer. Muffins are best stored in an airtight container for 3-4 days.